While policy and procedures are being streamlined, CII had taken an initiative to create a comprehensive database. CII has been approached by various stakeholders for creating an authentic database of Indian companies in the defence sector. Responding to their demand, CII Defence Directory is a step towards this direction which will benefit everybody – foreign OEMs, Indian SMEs, Ministry of Defence, Various directorates of the Indian Armed Forces. The Directory encompasses details of the companies engaged in/and having capabilities to supply various types of equipment, systems, sub-systems, components, spares and services to the defence sector. Directory also contains reasonably comprehensive data including major products, foreign holdings, joint ventures and other key features of the company including contact details. The directory will be instrumental in facilitating Joint Ventures and finding out Indian offset partners. The directory will be circulated to the Ministry of Defence, all the defence establishments, Indian Armed Forces, Foreign Embassies/High Commissions, foreign Original Equipment Manufacturers (OEMs), Indian & Foreign Companies and many prospective buyers/partners. 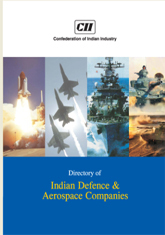 With the details of more than 400 Indian defence companies, Directory is now ready for sale. Please write to us to book your orders. 20% Discount for MSMEs on producing the MSME certificate. Courier charges as per actuals.